How did China’s international relations evolve between 1949 and 1979? After the end of the Chinese Civil War and the victory of the Communist Party under Mao Zedong, the country made his famous lean to one site. The relations to western countries were suspended, and the Soviet Union became China’s biggest partner. The country was like a junior partner of Moscow until it recovered from the war and gained more self confidence. In the following years China not only fought in a couple of wars, but also became the (self-called) leader of the Third World. In addition to that Beijing split with his former ally USSR and approached with his former enemy America. This essay discusses why China’s foreign policy changed that dramatically in not even 30 years. What motives where behind the decisions? Therefore it will be first analyzed the time of the Sino-Soviet partnership. What expected the country from Moscow and why did it breakdown with the West? The next part of this essay is the stronger China in the world as leader of the Third World. Especially the conferences in Geneva and Bandung should be analyzed. The final part discusses the Sino-Soviet split and the rapprochement with the US. Why did this radical change occur? How did domestic issues like the Cultural Revolution or the Vietnam War influence this decision? Beside a range of secondary literature, also especially Chinese documents should be analyzed. Beijing wanted to make a new start and to clean the house, and the country hoped for more economic and military assistance from the SU. Furthermore Mao used the rhetoric, that the US would be China’s enemy, to continue his revolution.3 A major step in building the Sino-Soviet friendship was the Mao-Stalin summit in 1949/50 where the two dictators met the only time face to face. The meeting was long and tough. In the first days Moa reports about his meeting with Stalin they two leaders discuss about the possibility of an US attack on China, which Stalin refuses by saying it is very unlikely because the American fear war.5 Also they discuss the legacy of the old Sino-Soviet Treaty and the lease of Port Arthur, where Stalin says he would withdraw his troops. Also in a later meeting of the summit between Mao and the Soviet secretary of state Molotov on 17th of January 1950 the Chinese leader says, that ‘the People’s Government of China is taking certain measures toward forcing the American consular representatives out of China.’6, after the Russian side tried to convince the Chinese delegation the need of an Sino-Soviet friendship against America. The Korean War showed that China still had to modernize to enter the global stage. In the while the country was more or less just the partner of the Soviet Union. Although China only took part in the Geneva Conference 1954 due to Russian request, the summit was very important for the communist regime entering the world stage for the first time. 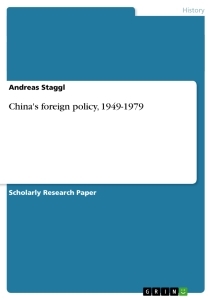 The Geneva Conference also shows how close the Sino-Soviet relationship was at that time. There have been arrangements about a common policy at all times, showing that the tensions caused by the Korean War did not yet lead to a split. For China the Geneva Conference has been a success. For the first time, the country was recognized as a big power and a common resolution was achieved China used diplomacy as an instrument to improve itself in the world. The Conference in Bandung was the next opportunity for it. This time China wanted to improve itself within developing countries. The Conference in Bandung was a step towards a third way in the Cold War, neutral to both big powers. Also it should be a step towards decolonization and anti-imperialism. 1 Jian Chen, Mao’s China and the Cold War (Chapel Hill, 2001), p. 44. 2 Mao Zedong, "On the People's Democratic Dictatorship," 30 June 1949, Mao Zedong xuanji Beijing: The People's Press, 1965, IV, 1477. 3 Jian Chen, Mao’s China and the Cold War (Chapel Hill, 2001), p. 44-46. 4 O.A. Westad, ‘Fighting for Friendship:Mao, Stalin, and the Sino-Soviet Treaty of 1950’, in Cold War International History Project Bulletin 8/9, p.224. 6 Conversation, V.M. Molotov and A.Y Vyshinsky with Mao Zedong, Moscow, 17 January 1950, in CWIHP Bulletin, p.233, http://www.wilsoncenter.org/topics/pubs/ACF197.pdf. 8 J.D. Spence, The search for modern China (New York and London 1990), p.524. 9 Mao cited in Chen Jian, The Sino-Soviet alliance and China’s entry into the Korean War, (Washington 1992) http://www.wilsoncenter.org/topics/pubs/ACFAE7.pdf , p. 26. 10 Telegram by Mao Zedong to Stalin on 2 October 1950, in CWIHP Bulletin 8/9, p. 237. 11 R. Steininger, Der Kalte Krieg [The Cold War], (Frankfurt 2003), p. 64. 12 Spence, The search for modern China, p. 533. 13 “Preliminary Opinions on the Assessment of andPreparation for the Geneva Conference,” 1954, CWIHP Bulletin 16, p. 12. 15 Minutes of Conversation between Zhou Enlai and Anthony Eden, 14 May 1954, Bulletin 16, pp.20- 22.